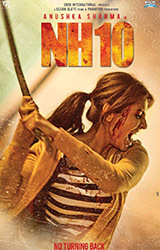 “NH10” Starring Anushka Sharma, Neil Bhoopalam, Darshan Kumar; directed by Navdeep Singh; music by Sanjeev-Darshan, Bann Chakraborty, Ayush Shrestha, Savera Mehta and Samira Koppikar. If the trailer is any indication, expect a gritty, edge of your seat, road thriller. After the blockbuster hit “PK,” Anushka Sharma who is known for her onscreen bubbly persona, stars as Meera and Neil Bhoopalam plays Arjun, a young professional couple from Gurgaon. Late one night, Meera is attacked after a party. She somehow manages to escape but the event leaves her traumatized. Arjun was not present that night and partly blames himself. They plan a luxurious weekend getaway. While stopped at a highway dhaba for dinner, they witness a skirmish, a young girl being picked up by a bunch of hoodlums. Arjun chooses to intervene, unaware of the danger that lies ahead. If you didn’t know, the title refers to National Highway 10, which goes from Delhi to the Pakistan border in Punjab. It’s a story of survival and courage. A woman stacked against all odds manages to not just stick it out but also give it back! Navdeep Singh previously directed the critically acclaimed “Manorama Six Feet Under.” The film is co-produced by Sharma herself and Anurag Kashyap’s Phantom Films. 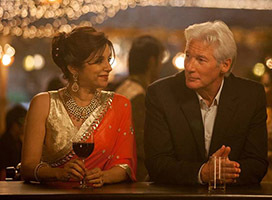 “The Second Best Exotic Marigold Hotel” Starring Judi Dench, Maggie Smith, Dev Patel, Bill Nighy, Tina Desai, Lillete Dubey, Richard Gere; directed by John Madden. If you enjoyed the first comedy, you can revisit old friends. Dev Patel returns as Sonny and his dream for expanding the hotel is taking more time than he has to spare. He’s about to marry the love of his life, Sunaina, played by Tina Desai, and has his sights on a promising property since his first venture has only one vacancy left and new arrivals are eminent. Richard Gere and Tamsin Greig are the newcomers. Judi Dench and Bill Nighy return as Evelyn and Douglas who have now joined the Jaipur workforce and are wondering where their dates will lead. Madge played by Celia Imrie juggles two wealthy eligible suitors while Norman and Carol, played by Ronald Pickup and Diana Hardcastle, are negotiating their exclusive relationship. Perhaps, the keeper of all secrets and new co-manager, Muriel, portrayed by Maggie Smith, may have answers. As the stress and demands of a traditional Indian wedding are felt by all, an unexpected way forward presents itself.